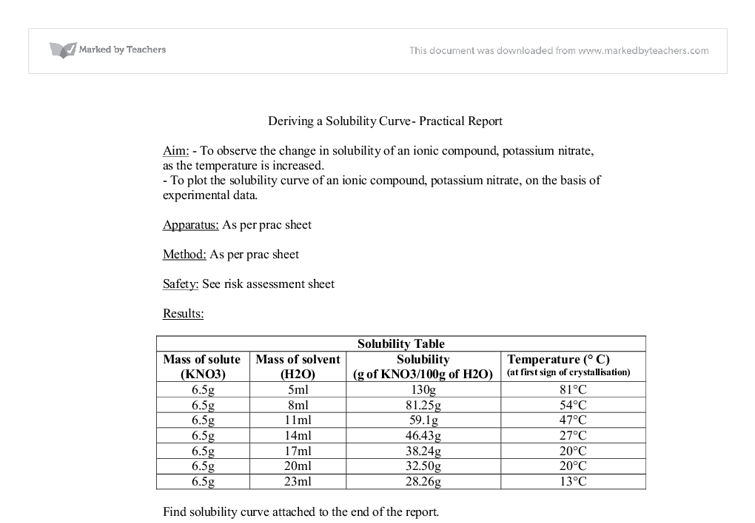 Deriving a Solubility Curve- Practical Report Aim: - To observe the change in solubility of an ionic compound, potassium nitrate, as the temperature is increased. - To plot the solubility curve of an ionic compound, potassium nitrate, on the basis of experimental data. Apparatus: As per prac sheet Method: As per prac sheet Safety: See risk assessment sheet Results: Solubility Table Mass of solute (KNO3) Mass of solvent (H2O) Solubility (g of KNO3/100g of H2O) Temperature (� C) (at first sign of crystallisation) 6.5g 5ml 130g 81�C 6.5g 8ml 81.25g 54�C 6.5g 11ml 59.1g 47�C 6.5g 14ml 46.43g 27�C 6.5g 17ml 38.24g 20�C 6.5g 20ml 32.50g 20�C 6.5g 23ml 28.26g 13�C Find solubility curve attached to the end of the report. Calculations: To find solubility, the mass of solute (KNO3) was divided by the mass of solvent (H2O), and then multiplied by 100. 6.5 � 100 = 130 5 6.5 � 100 = 59.1 11 6.5 � 100 = 38.24 17 6.5 � 100 = 28.26 23 Questions: Refer to prac sheet for questions. 1) From the graph of the solubility curve, it can be determined that: a) ...read more. is the solvent. Polar molecules and Ionic Compounds A polar molecule has both positive and negatively charged ends. Water is a polar molecule because it has a difference in electronegativity between atoms, and has an uneven distribution of charges (molecule is asymmetrical): Due to the difference in electronegativity between atoms, the oxygen atoms are slightly negatively charged because they have greater electronegativity (ability to attract negatively charged electrons), and the hydrogen atoms are slightly positive. Potassium nitrate (KNO3) is an ionic compound because the potassium (K ) is positively charged, and the nitrate is negatively charged (NO3 ). The electrostatic forces of attraction between the oppositely charged ions hold the ions together (ionic lattice), forming an ionic compound. Dissociation Potassium nitrate is able to dissolve in water because H2O is polar and KNO3 is an ionic compound. When potassium nitrate is placed in water, the slightly positive charge of the H2O molecule is attracted to the negative ion, NO3, and the negative charge of the H2O molecule is attracted to the positive ion, K. As water molecules are in a continuous state of random movement, they pull the potassium cations and nitrate anions of the outer part of the crystal out of the lattice structure and into the surrounding solution. ...read more. 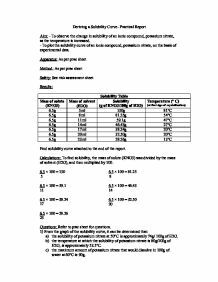 By changing the ratio, we are able to observe the relationship of temperature to solubility. It was heated and once again, cooled (with the aid of cold water to speed up the process) until the first sign of crystallisation. These steps were repeated several times, so that a sufficient amount of recordings could be used to draw an accurate solubility curve. Errors: The systematic error in this experiment is the possibility of a calibration error on the balance. Random errors in the experiment include: measuring the incorrect amount of water added to the solution, incorrectly reading the thermometer, not noting the temperature at the exact moment crystallisation starts to occur, heating the water to a point where some begins to evaporate (changing the ratio of solute to solvent) and a possible mistake in graphing the solubility curve. Improvements include: more time needed to gather more data (possibly do the experiment again and find an average to even out extreme results), and a stopper on the test tube would stop the evaporation of water. Conclusion: The solubility curve derived from the experiment visually shows that as the temperature of the solvent (H2O) increases, the solubility of the solute (KNO3) increases as well (more potassium nitrate can be dissolved in 100grams of H2O). ...read more. For this experiment, the results are basically based on reading the graduation marks of the burette, the pipette and the conical flask. In all these apparatus the angle at which the meniscus was read may have caused inaccuracies. If the graduation marks are not read well, the results would all be completely different. The computer can provide better accuracy than I can as far as drawing the axes and plotting the points is concerned. However, I believe that I can provide more accuracy when drawing the line or curve of best fit.My line of best fit suggests that the reaction, with respect to potassium bromate(V), is first order. Testing for cations (Substance J) 1. A small spatula of substance I was added to a test tube, along with distilled water filling half of the test tube. I then empty the pipette into the volumetric flask, and touch the end of the pipette onto the side of the volumetric flask, to empty that final trace of the acid. 5. I will then fill the volumetric flask with distilled water up to the 250cm-3 mark.